If you walk into an Italian restaurant, you can probably find tiramisu on the menu. Admittedly, many people walk into an Italian restaurant just for the tiramisu. Tiramisu is a relatively recent invention that is either Venetian or Trevigian. There are plenty of variations of the dessert; some use raw eggs while others use cooked, and some use coffee-flavored liquor while others just go for the espresso. This is my version of tiramisu, which uses a zabaione (recipe attached below). Zabaione is a creamy dessert made of eggs, sugar, and wine. The eggs are cooked, so there’s no risk of foodbourne illness. Even better, it’s a great way to practice making zabaione because the tiramisu will turn out well even if you over or undercook it. 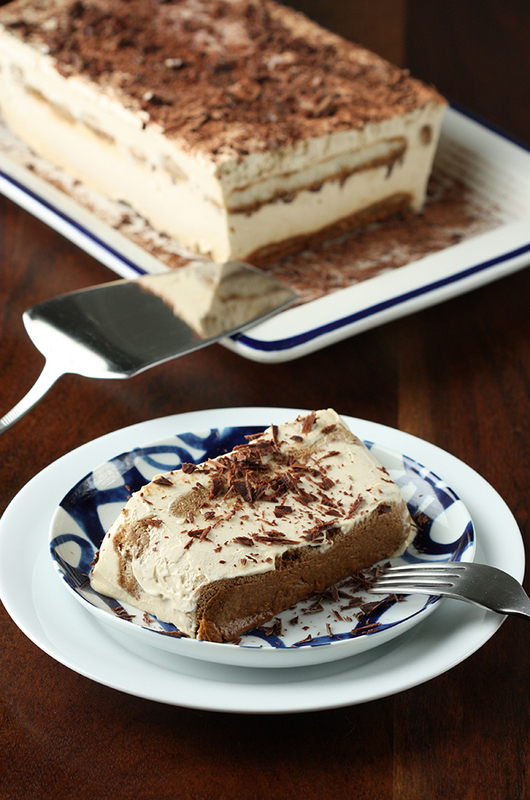 I also incorporate cream in my tiramisu, because mascarpone is much thicker in America than in Italy. Ready to knock your friends’ and family’s socks off with my tiramisu recipe? Here’s what you’ll need for 12 servings of this incredible, indulgent dessert. Make zabaione ahead of time, allowing it to cool in the refrigerator. You can make it the day before if you like. Make the espresso or Italian coffee in a moka pot. Make sure that it’s ristretto (or thick and extra strong). Mix it with the sugar and rum. If you choose not to include rum make an additional 1.5 OZ of coffee. Chop the chocolate into at least pea sized particles (it’s nice to leave some big chunks). Soak the biscotti in the coffee mixture. You can do this by rolling them in a pan in which you have poured the coffee, or by pouring the mixture on the lady fingers with a squeeze bottle. Put the mascarpone in a bowl. Using a mixer, slowly beat it until smooth. Avoid incorporating too much air in it, because this will decrease flavor in the final product. Pour the heavy cream into the bowl with the mascarpone and mix at slower speed until it’s well incorporated and the cream has been effectively whipped to soft peak consistency. Mix the zabaione with the mascarpone and cream, again avoiding beating too much air into it. Pour about half the mixture in the loaf pan you’ve lined with the biscotti, make sure it leveled (ideally with a bowl scraper spatula). Do not tilt the pan back and forth to achieve this, as the lady fingers will move! Do not be alarmed if the mixture seems too liquid to you, have confidence! Sprinkle about 70% of the chocolate on top of this. Place another layer of lady fingers soaked in coffee on top of the mixture. You will likely have to cut little extra pieces to fill the surface neatly. Press down on it with the palm of your hand to make sure they are nicely settled in the pan. Pour the rest of the mascarpone mixture on top of this. Smooth it out if need be, and sprinkle it with the rest of the chocolate. Cover the pan with plastic film and place it in the freezer overnight. This allows for a chemical change to occur, which happens at these low temperatures, and congeals the dessert together. Take the tiramisu out of the freezer at least 6 hours before you intend to serve it, unless you would like to serve it in pre-cut portions; in this case, you can take it out just two hours before. Remove the plastic film and place the container in very hot water for 5-10 seconds (take care not to let any water inside the container). Flip the container onto a cutting board, and push down on the top to make the tiramisu come out. At this point, it’s like a solid brick so you can handle it without concern. You can slice pieces out of the tiramisu (best is the width of a ladyfinger); if you choose to do this, you can put it back in the freezer. You can place the tiramisu onto your intended serving platter, cover it with plastic film, and put it in the refrigerator. About six hours later, it should be fully thawed out and ready for service. It can stay in the refrigerator for at least a day. I like to decorate my tiramisu with more chocolate shavings, because who would say no to more chocolate, but the choice is yours. Now sit back, relax, and watch your friends and family be wowed.